Curling events for companies, training sessions for beginners, social sport evenings including a professional presentation, organizing tournaments and refreshments. 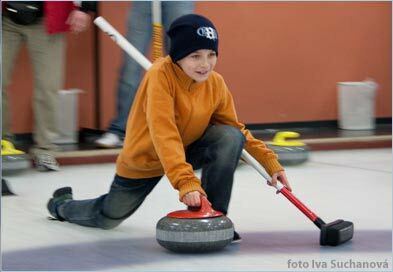 Professional consultations and information about curling. 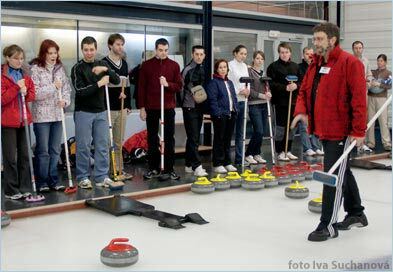 Corporate teambuilding based on the principles of curling. On a recreational level curling is a physically undemanding game for two teams of four players who attempt to show their team spirit, concentration, estimate of the length and strategic thinking. 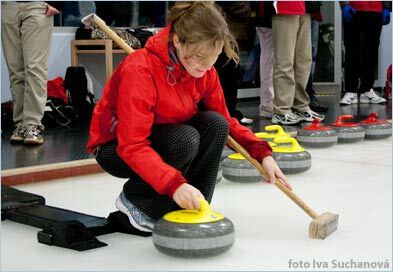 Thanks to these attributes curling has become very popular for corporate and teambuilding events and smaller social gatherings. Reservation and binding orders of the sheets take place exclusively by e-mail sent to the address info@curlingpromo.cz. The orders are dealt with in the order they are received. The ideal starting point for mutual communication is to fill in and send off the inquiry form above. Cancellation of the binding order less than 20 days before the event will be charged in full extent. Information given on the phone is not relevant, does not belong to the reservation or the binding order. All conclusive is the content of e-mail. There are 4 sheets in the Arena. In the ideal case two four-player teams compete on one sheet. 1-3 sheets is possible to rent on weekdays before 15:00 o´clock, respectively before 16:00 o´clock. Later all four sheets have to rent. Weekends are usually determined to league competitions, anyway if you are interested in a weekend date, ask us. The price for each sheet includes curling equipment (sliders, stones, brushes), specialist explanation and supervision by an instructor from the ranks of extra league and premier league players who also provides introductory familiarisation with the game. The instructors can also speak English. The temperature in the hall ranges from 6C to 9C, so warm, loose sports clothing and sports footwear are appropriate. Special emphasis is placed on footwaer cleanliness, which is carefully checked before stepping out onto the ice. Each person taking part can get a special sleeve for one shoe, which allows them to "slide" over the ice. The club´s restaurant tribune offers a good view over the curling sheets. There is possible to book a table or order a banquet for up to 120 people in numbers +420 272 911 854 / +420 777 235 129. Download and print out the diplomas for your sports and social event. There are diplomas for the 1st - 3rd place in PDF format below the icons. If you wish, we are able to add a logo of your company into the diploma. The PDF files are saved so that they can be edited in programs applicable to the vector graphics such as Illustrator. Perfect gift for everyone! We will gladly prepare a gift voucher for pre-agreed number of hours, sheets and persons. According to official rules two teams (in ideal case four-player teams) compete against each other on one sheet. Each of these has a set of eight stones at their disposal with different colours to those of their opponents. Sliding all sixteen stones is called "end". Competitive matches last either 8 or 10 ends or when the time limit expires. Each player slides two stones in one end, always alternating with their opponent. Sweeping can change the direction and length of the travel of the sliding stone. The aim is to place and keep your stones closer to the centre of the cirlces than those of your opponents. The winning team gains a point for each of its stones in the target rings, which is also nearer to the centre than any of the opponent´s stones. In the picture top left you can see that a team playing with yellow stones gains one point for its stone in the circle. After the set number of ends has been played or once the time limit has expired, the teams add up the total number of points and decide on the winner.